I have always loved Dayspring cards from my local Christian Bookstore. I felt like if someone took the time to send me a Dayspring they really knew my love of Christ and the Word of God. DaySpring has expanded to so much more in the past years. They offer cards still but also gifts that reflect the Christian message. I am always on board with 'wearing my faith', because I seek to walk to walk and talk the talk. I was super excited about reviewing the Daughter of the King Reusable Tote. Being a homeschooler I tend to use tote bags everytime we leave the house, weather for library books or the kids supplies for an outside class, the need is there for something other than my purse to hold all of our 'stuff'. Daughter of the King, what a humble reminder that despite how our day may be going, our place in God's family has not changed. That we could be out there in the world shuffling from place to place and running into some folks that are less than congenial, that doesn't change who my Daddy in heaven is! Simulated leather in pinks and orange, so girly for the Daughter of the King! Magnetic closure so my things don't topple out. And inside pockets for those pens, pencils, and small school supplies. I was blessed to receive a surprise 2nd tote for my review!! A beautiful Crown of Beauty reusable tote to pass on to someone special to bless their life. I have been giving a lot of thought to that and think I know just the gal to mail it to. Someone who has been walking a difficult path lately as her hubby has Lou Gehrigs disease and her family needs all of our prayers. With 3 young boys to raise she needs to know God is crowning her with beauty and will fill her with His joy. I pray that it will inspire her and help her on her journey. So Barb F, if you are reading this be watching for your blessing in the mail soon! I jumped in there and managed to secure a giveaway tote bag for my readers!! 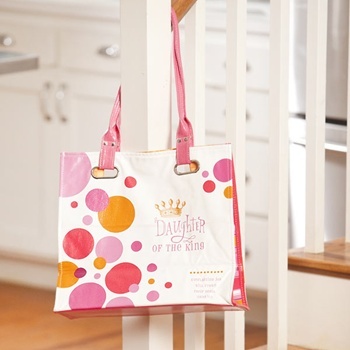 Super excited to have DaySpring offering you one of the Daughter of the King tote bag! DaySpring has a special Tote sale going on right now—they are Buy 2 Get 1 Free! This includes both regular price and clearance totes.Visit Here for your Great Savings! Use the Rafflecopter for Entries to win The Daughter of the King Tote from Day Spring!! USA Only, Ends June 27 at midnight! It means He loves me- He really loves me! Having a royal heritage for eternity! No matter where you come from or where you are going you can rest in the "title" He has given you. It means I am the daughter of an awesome heavenly father, who loves me more than I could ever fathom. It means that we as women (and girls), deserve to be treated with respect and hold ourselves to a higher standard. It means to me that God loves and cares for me, and that I'm important to Him. It means being unconditionally loved by the God of the Universe, the One who is in control and therefore, I don't need to worry about anything or anyone! Just popping in to say THANK YOU for joining Inspired Deals this month. I chose the Daughter tote, too, and it makes me smile seeing it pop up in a lot of these posts! It means that as a woman, I will always have a heavenly Father who loves me unconditionally! It means God loves me. I am HIs princess. A precious title of knowing God loves me!